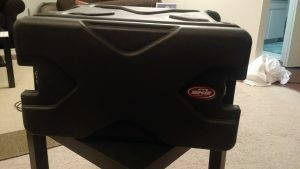 An older 6U SKB Roto Case with wheels. This case was a nice choice since I had access to one already. The back door doesn’t close super tight since it’s just a plastic cover. It’s enough for now until I want to upgrade this project. 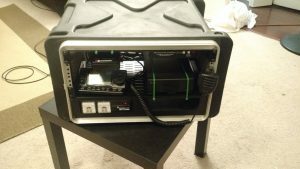 I am building this case with the goal of having two radios in side. 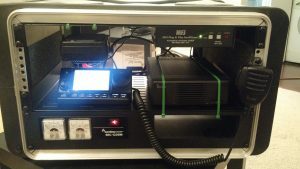 IC 7100 + MFJ939I with an external speaker. 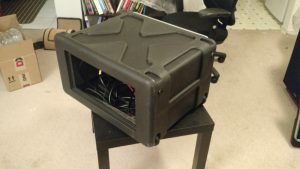 The bottom left of the case is my SEC 1235M in a rack kit that can hold two. I’m going to use the second position to hold my IC 7100 so that radio head can sit above it. What is what? Starting at the very bottom is a Samlex SEC-R2 holding a Samlex SEC-1235m power supply. 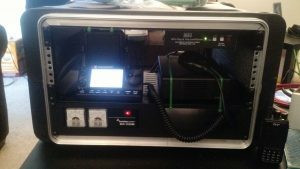 Above that is a Raxxess brand 1″ shelf holding my IC 7100 and it’s remote head. The 7100 is held in by zip ties at the moment. I am waiting for the mobile mount. The control head is held in by love. Above that is a DXE-281 speaker and MFJ-939I. 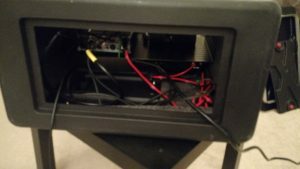 The MFJ is held in by two screws that are part of the case, I ran them through the slotting in the shelf. Zip ties are holding the speaker in place.